Red Salmon Theme Use Red Salmon restaurant website theme and show how elegant your restaurant is. Attract the klintów with great photos and build your brand on the internet. Build restaurant website with UpMenu. UpMenu quality Let your restaurant look great online! Red Salmon restaurant website template is a convenient way to accomplish that. It is comfortably integrated with UpMenu. You may make changes whenever you feel like it thanks to CMS support. 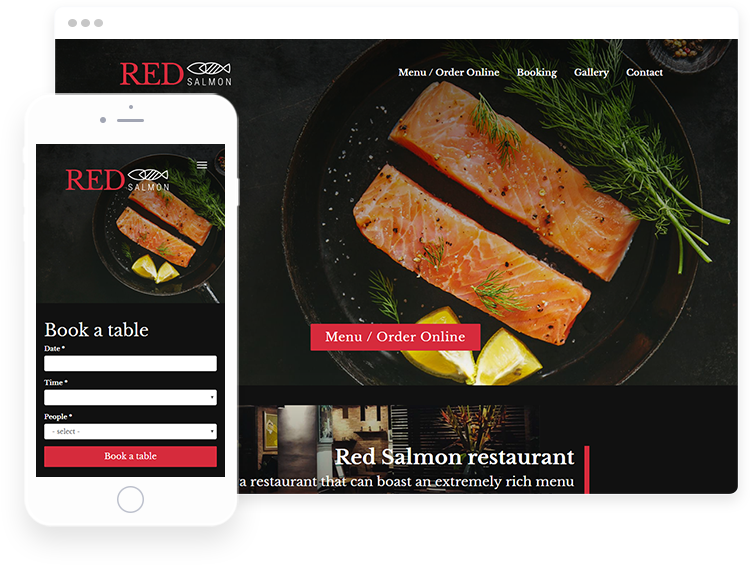 One of a kind Red Salmon template Red Salmon is a restaurant website theme which looks different than classic templates. It focuses on highlighting the special benefits of your food place. You may modify it yourself in your favorite way. Nevertheless, one of a kind theme will help you create a truly sophisticated website. For your unique restaurant This original proposition is the best choice for food places in a fancy style. Red Salmon looks very luxurious and fashionable. It will work well for instance for restaurants which serve French or Mexican cuisine. The template is also a good choice for spicy, intensive dishes. Sales increase The special restaurant needs to provide customers with quality features. Website in a delicious style is a perfect way to reveal how much value is in your food business. Such things are very useful when it comes to building and maintaining customer satisfaction and working on development in sales.